So whats up with the caffeine and tea? We get this question all the time. Either someone is looking for a tea to help jump start their day or they are looking to avoid caffeine as much as possible. While the question is a little complicated we do our best to give you the most up to date information on the subject. 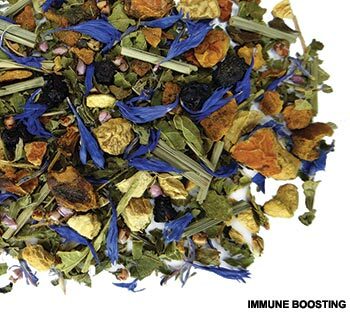 There is one definitive thing we can say and that is what herbal teas are caffeine free. Rooibos, Tulsi, Fruit Tisanes and our herbal section are all (except for the Watermelon Green Tea and the Tulsi Chai) caffeine free. They simply do not produce it. Now where it gets complicated is when you try and figure out Tea (camellia sinensis) and Yerba Mate. Yerba Mate has three different stimulants in the leaf naturally: caffeine, theobromine (euphoric stimulant associated with chocolate), and theophylline (primary stimulant in green tea). This combination produces an alertness that lasts longer than just caffeine, and has no associated jitters or crash. When it comes to caffeine content in tea there becomes many variables that effect the caffeine content. Keeping in mind that all White, Green, Black and Oolong tea come from the same tea plant, the camellia sinensis. You would initially think that they should all have the same amount. Not true. Many factors come in to play such as when the leaf is harvested, how it is processed, the temperature when steeping, and how long you are steeping. White tea is said to have the least amount of caffeine when brewed because of a few factors. White Tea is the immature leaves and buds, and when brewed you typically use lower temperature water for the least amount of time. Now there is still some debate about this but this is what the industry has gathered to this point. Green Tea is similar to white tea in that you use a lower temperature when steeping it and for less time than say a black tea. Green Tea is a mature leaf and the temperature and steep time are slightly more than White tea but it still does not allow enough time for high amounts of caffeine to be extracted from the leaf into your cup. Oolong tea is right there between green and black. Depending on how long it is partially oxidized may also determine how much or how little caffeine you are able to get extracted from the leaf when steeped. Trying to put a caffeine content number on this type is very hard. Black tea has the most caffeine from the tea plant. Being fully oxidized, and steeped the longest at a near boiling water temperature all combine in being able to transfer the caffeine into your cup. Even though all tea, even white and decaffeinated, have caffeine, comparing it to all the other caffeine stimulated drinks on the market these days is really quit small. Because there are so many variables, no one can tell you without a doubt how much caffeine is in your cup. 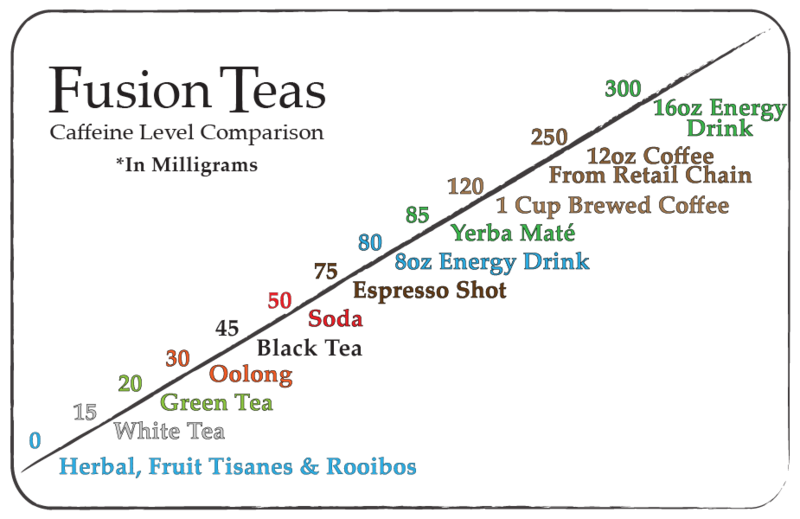 Despite this we wanted to create a visual for you so you can see what tea is going up against in terms of caffeine. Unfortunately we live in a society where we are constantly trying to over stimulate our bodies to try and get more done or meet a deadline. We believe that tea can provide all the energy you need. And if you want a little more oomph, Yerba Mate is gentle enough to get you through that midday feeling. We hope this has helped shed some light on a very complicated subject.